Buzz words are aplenty in the world of wine. For those who are not well-versed in all things vino, walking into a tasting room and hearing someone causally drop terms like “nuanced” and “minerality” might make you want to start immediately backtracking and consider doing something else entirely. Trust me, I have been there. Words like these (particularly coupled with glass swirling and mouth swishing – yikes!) can be a bit intimidating to the wine novice. “Vintage” and “vertical” are two other frequently used words from this collection of intimidating wine jargon. Many of you already know what these words mean, but for the sake of understanding that everyone is on a different step in their oenophile journey, here are some simple definitions. Vintage: wine from a particular growing season. Vertical: a tasting of the same wine from consecutive vintages. How often do we have the opportunity to interact with four different incarnations of the same living, breathing thing (yes, wine lives and breathes!) and experience first hand how it has evolved? Alas, no such human vertical exists, but how cool would it be if we could sit down with potential significant others, roommates, coworkers, in-laws, etc. and chat with their former selves?!? Getting a snapshot of their past sure would tell us a lot about where they have been and what they are capable of becoming in the future. In the world of wine, verticals give us this snapshot, allowing us to explore how vintages put their unique stamps on the same style of wine over time. Beyond just getting a taste for how the weather influenced the fruit from that growing season, a vertical gives drinkers a sensory peek into the evolution of that particular wine. Viticulture practices, winemaking style, and brand philosophy are also evolving as the winery team grows wiser and more in touch with what the land has to offer. With that being said, we are SUPER excited to release our first ever vertical, so all of you can experience our story firsthand. 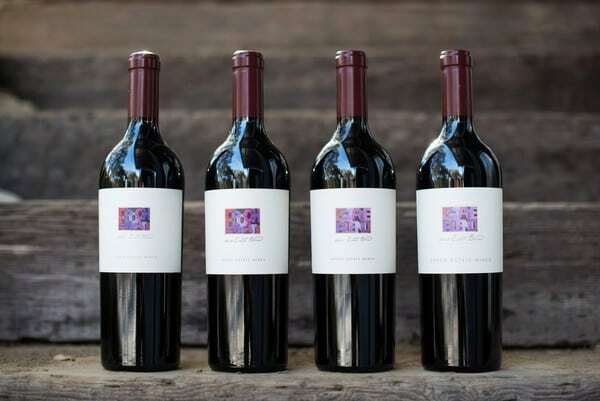 We invite you to sit down and catch up with the ’09, ’10, ’11, and ’12 Estate Blend this holiday season. OR as we discovered in our Team Vertical Tasting last week, you could also cellar this 4-pack for another year or two; all four of these wines are aging beautifully! Though the varietal percentages vary and even the varieties included differ a bit amongst these four, the common thread of our Estate Blend is this: a Syrah based blend with Grenache, Mourvedre, and Tempranillo. As you will see below, Zinfandel makes an occasional appearance in this blend, and Counoise pops up in the ’11 to say “‘sup.” What we love about our Estate Blend is that it is a wine that gives our awesome Winemaking Team the opportunity to showcase how our estate vineyards are doing during that particular vintage using so many of the varieties that we grow. Growing season: coolest on record until 2011; Later bud break; Harvest: Middle of Oct.